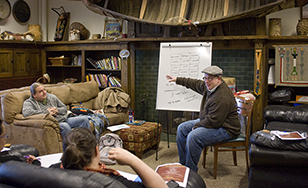 Michael Sullivan teaches an advanced Ojibwe class. Michael Sullivan opened a recent standing-room only faculty presentation in rapid-fire Ojibwe, drawing laughter from a few audience members. He then issued a quick disclaimer in English: "For those of you who don't speak Ojibwe, you're going to miss out on some of the jokes." Sullivan, an assistant professor of Ojibwe in Global Cultural and Language Studies, then launched into an hour-long discourse about Ojibwe - in English. He covered the basic structure of the language, its geographic reach, and current efforts to revitalize it for the future. He kept the discussion light, lively and relatable, making the topic immediately accessible for everyone in the audience. It was obviously a pleasure for him. "It's very rewarding work when you see the fruits of your labor among your own children," Sullivan says. "I love, love, love what I do, and what I'm involved with. It's very meaningful." A linguist from the Lac Courte Oreilles band in northwest Wisconsin, Sullivan's interest in Ojibwe or Anishinaabe language preservation is deeply personal. Although he grew up on the reservation near Hayward, WI, like most kids in his generation he was raised speaking English. "English has always been seen as the language of opportunity," Sullivan said. "Most indigenous cultures don't want their children to learn their heritage language. It's a huge issue that minority communities are facing everywhere across the world. People my age inherited this huge responsibility to do something about it before it's too late." The son of an Ojibwe mother and an Irish father, he experienced his native language through the sacred ceremonies conducted on the reservation. He heard it spoken by members of his grandmother's generation, and took for granted that it would always be there. As he grew up, he realized that the language of his people was endangered. After completing his undergraduate degree, he was leaning toward law school. But the death of his great uncle - the last person in his family who had spoken Ojibwe as a first language - awakened something in him. "That just sent me into a panic. I really wanted to do something." Sullivan looked into linguistics programs and eventually landed at the University of Minnesota, where he completed his graduate work. He conducted research, assisting in putting together an online Ojibwe people's dictionary, and has been involved in a variety of other projects as well. He served as a translator for the award-winning film "First Speakers," which won a regional Emmy. And he worked with Elder Eugene Stillday - one of the "main voices" of the Ojibwe people's dictionary - on a children's book that won the 2011 Library of Congress' Minnesota's Book of the Year award. Still keeping busy, Sullivan is now working on completing his doctoral dissertation focusing on relative clauses in Ojibwe. His contributions to the language have not gone unnoticed by his peers. "Michael Sullivan is one of our bright, rising stars," said Anton Treuer, executive director of the American Indian Resource Center at Bemidji State University. "His accomplishments and contributions to Ojibwe language, ceremonial, and musical traditions have already surpassed what most people do in a lifetime, and he's really just getting started. I look forward to many great things yet to come from him." Sullivan is an active supporter of the Waadookodaading Ojibwe language immersion school on the Lac Courte Oreilles reservation, where his children attend classes. The school, which started as a kindergarten pilot program, now goes to 5th grade, offering all elementary school classes in Ojibwe. "A big part of the vision originally was that not only would Waadookodaading create new speakers of Ojibwe, but it would also create a new, healthy community that mirrored the principles and lifestyles of yesteryear," Sullivan said. "So for the first time ever in a formal school structure, our children are being educated by young, healthy, sober American Indian men and women who speak their tribal language and who are these incredible role models. It's a first anywhere in Ojibwe country." Some teachers at the immersion school came through St. Scholastica's own Native Teacher program. "The Native Teacher Program has produced a number of teachers who have gone into Ojibwe immersion teaching," Sullivan said. "At Waadookodaading alone, there are two lead teachers with CSS degrees, both of whom are currently finishing M.Ed degrees through CSS. There's also a teacher's aide who came out of CSS and will most likely be a lead teacher next year. In addition to the immersion teachers, there are many who teach Ojibwe as a subject in mainstream schools, one of them being an elementary Ojibwe teacher at Lac Courte Oreilles Ojibwe School." That track record can help attract students to St. Scholastica, he noted. "Part of the benefit of coming to St. Scholastica to study Ojibwe is the close relationship that we have with all of our immersion schools due to our faculty, students, and grants we've received. We'll teach you Ojibwe while pursuing your degree and then we'll get you a job in one of the schools doing exactly what you dream of." By working with both the reservation's native-speaking elders as well as its youngest children, who are now being raised to speak the language of their ancestors, Sullivan is already seeing progress in ensuring a robust future for the Ojibwe language. Out of 300 Native languages, Sullivan said, Ojibwe is one of only three that's projected to survive the next century. "The stage is set, especially at Lac Courte Oreilles. We're in charge of our educational destiny." After an enlightening sample of Sullivan's Ojibwe language knowledge, attendees at Sullivan's recent on-campus talk were in for one last treat, as his sons gave an unforgettable musical performance of song and percussion. With only their young voices and drums, 10-year-old Nizhoo and 7-year-old Preston filled the large lecture hall with the ancient sounds of their people. The boys had just returned from Washington, D.C., where they had been invited to share their music in front of hundreds of delegates at the 2014 White House Tribal Nations Conference. They even got to take a "selfie" with President Obama - just one more reward for their family's dedication to Ojibwe language and heritage preservation.